For college students, taking a nap can solve a lot of problems: from not getting enough sleep the night before and getting a necessary boost of energy, to fulfilling the need to relax, or to even pass the time, naps seem to be the solution to almost everything. However, the length of your nap is one of your most important decisions regarding this middle-of-the-day snooze. While one might think that a 6-minute nap is awfully short, scientists have proven that it enhances memory function, which can be beneficial right before an exam. A 10-15 minute nap will improve one’s productivity and focus. This time interval is ideal if you need to check things off of your To-Do-List later in the day. A 20-30-minute nap will naturally boost alertness and concentration. This slumber will also sharpen your motor skills, which you need to type and text. A 40-60-minute nap is helpful at getting your mind back on track. This nap allows you to enter into a REM (rapid eye movement) Cycle. Therefore, it will strengthen your ability to remember information and enhance your creative capacities. One downfall to this length of rest is that you may wake up feeling groggy, which is a result of sleep inertia. This feeling may last up to thirty minutes before napping, so it is important to make sure you have time to recover. Lastly, a 90-120-minute nap will also increase creativity. It results in improved emotional and procedural memory, which is needed when learning a new skill or information. A two-hour nap will keep you alert for up to 24 hours. During this length of sleep, you are more likely to go through one full sleep cycle, making you less likely to experience sleep inertia, which occurs during a 40-60-minute nap. In addition to these findings, several students here on campus were asked about their napping habits. 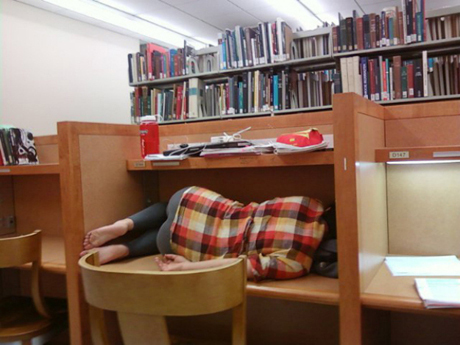 The times and reasons for napping varied widely among these students. Some, like junior Marie Johnson, says she normally naps on days that follow a particularly late night with little sleep. On the other hand, junior Caitlin March usually naps once a week for up to three hours. Her reason for napping involves tiredness from working on homework. Others like junior Abby Blakeny and sophomore TJ Culclasure nap when they’re bored or looking to relax. Blakeny says she naps once or twice a week for about 40 minutes while Culclasure naps approximately two times a week for 45 minutes to achieve a short time of relaxation. Napping is prevalent among many of Messiah College’s students, and as research has shown, this restful break has many benefits for both the mind and the body. The next time you lay your head down, remember that you’re doing yourself a favor. Happy napping!